“Smallfoot” delivers a bright, positive message for younger audiences, a soundtrack full of catchy tunes, and lots of physical humor. That’s about all it delivers. Is that a bad thing? No, not necessarily, and it should translate into a solid family-friendly hit at the box office. But for parents and for movie goers maybe hoping for some of the depth and ambition in terms of storytelling that we’ve seen in other animated features of late, “Smallfoot” comes up short. “Smallfoot” tells the story of Migo, voiced by Channing Tatum (“Side Effects“). Migo is, well, he’s a yeti. In fact, he’s a member of a large community of yetis living on a mountain peak in the Himalayas so high up it’s above the clouds, or so it seems. Migo lives his life firm in his understanding of the world and his place in it. He’s a happy go-lucky guy who knows where life is going … until one day he doesn’t. An accident leads to a chance encounter with something he believed didn’t exist. It’s something everyone in the village, especially their elder, Stonekeeper (voiced by Common) simply accepts as nonsense. Naturally, when Migo tries to explain his discovery, no one believes him. But he knows what he saw, and with the help of a small but determined group of believers, he finds the courage to learn the truth. Of course, the “smallfoot” do exist. But when he finally finds one, namely TV nature explorer Percy (James Corden), it leads both his people and Percy’s to a crossroads neither was prepared for. 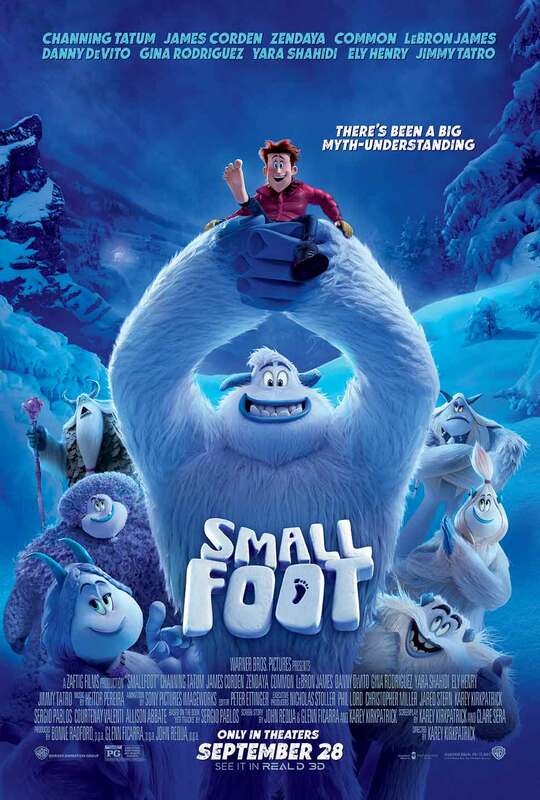 “Smallfoot” comes from the artists at the Warner Animation Group, the hallowed creators of the “Looney Tunes” cartoons. 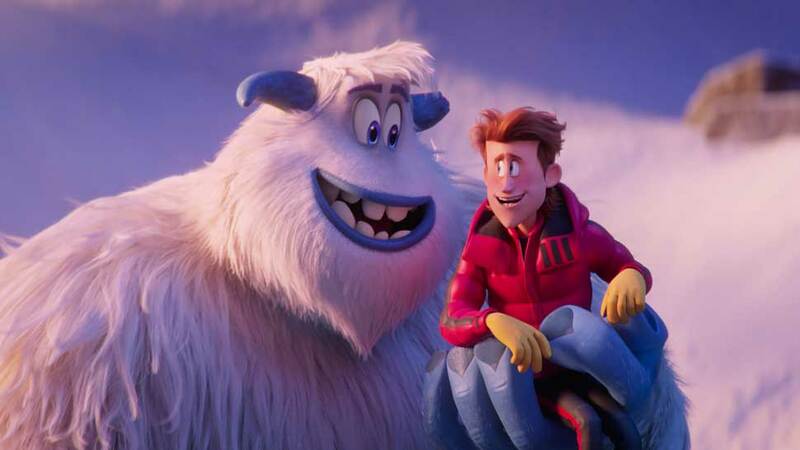 As the marketing materials for the film will tell you, much of what goes on visually in “Smallfoot” was inspired by those classic animated short films. On the surface, that’s true — when we think of Bugs Bunny and company, pratfalls and physical gags just come with the territory. This film has plenty of pratfalls, as well as every other kind of fall imaginable. The fall-down-go-boom humor, along with the film’s impressive work creating the vast, snow-covered vistas of the Himalayas, should keep the film’s youngest audience members entertained. What’s missing for the most part, however, is the subversive element the original Looney Tunes writers and animators included in those famous (and some infamous) shorts. It’s tough to pick up on some of the references in the current day, as some are more than 40 years old, but those cartoons were full of political and social commentary. A few were even so racist by today’s standards that they haven’t been broadcast since the late 1960’s. That sort of subtext is all but absent in “Smallfoot.” Yes, the film does lightly touch on some more complicated social concepts. Xenophobia and the question “is ignorance truly bliss?” play heavily in the film’s story. But it’s all presented in such a gentle, harmless way that it lacks any real resonance. It’s there and it’s teachable, but it’s watered down. “Smallfoot” does feature enjoyable voice talent work from a few surprising sources. Channing Tatum, who can come off in live action as somewhat wooden in his delivery depending on the role, injects plenty of energy into his work here. He makes Migo extremely likable as the film’s well-meaning but conflicted hero. Zendaya, meanwhile, delivers a warm, vibrant turn as Meechee, Stonekeeper’s daughter. We all knew she could sing from her work in “The Greatest Showman“; her musical number here “Wonderful Life” shows off those talents again in a song that may earn some Oscar attention when the season arrives. James Corden also provides a fun turn as Percy, and listen closely to the voice of Gwangi, the burly yeti who sees secrets and conspiracies everywhere. That’s LeBron James stretching his range beyond the basketball court. All total, “Smallfoot” makes for lots of kid-friendly fun at the movies. The grown-ups, meanwhile, may come away with the songs stuck in their heads for a while, but not annoyingly so. Does it feature the depth and cleverness that most animated features from the House of Mouse deliver to audiences these days? Not even close. That doesn’t mean it’s not worth seeing. There’s plenty to enjoy, so simply take it for what it is: a funny, goofy, and ultimately feel-good story. Starring the voice talents of Channing Tatum, James Corden, Zendaya, Common, LeBron James, Danny DeVito, Gina Rodriguez, Yara Shahidi, Ely Henry and Jimmy Tatro. Directed by Karey Kirkpatrick.